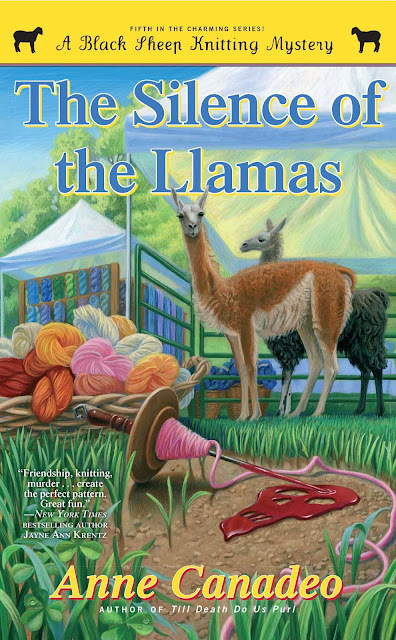 The Black Sheep Knitters attend a thread and fiber festival and end up investigating an attack against the local llamas in this fifth charming mystery series, with bonus recipes and knitting ideas. Ellie and Ben Krueger arrived in Plum Harbor eager to live out their dream—tending a herd of gentle, friendly llamas for fun and profit, on a farm just beyond the village. Their grand opening fiber festival kicks off on a bright note but abruptly ends in malicious mayhem. Knitting shop owner Maggie Messina and her friends soon learn that this is not the first time a vicious visitor has called. The Kruegers suspect that Justin Ridley, their eccentric neighbor, is the troublemaker. A misfit and loner, he’s known to roam the woods all night, though no one knows for sure what he’s hunting. Then there’s Angelica Rossi—the lovely owner of a rival fiber farm—who’s been as busy as a spider, spinning spiteful lies about the Kruegers’ yarns. Or, are the naïve newcomers merely caught in the tangle of Plum Harbor politics, and an intense land protection debate? Suddenly, vandalism turns to murder—and the Kruegers’ dream descends into a nightmare. The Black Sheep knitters must pull the threads together and uncover this crafty menace . . . before more lives—and more llamas— are lost. I picked this one up for a challenge where I had to find llamas on a cover. Outside non-fiction, that isn't the easiest thing to do. I don't know much about these animals, although I did find out from this book they're usually sweet and make loyal pets. The title is funny for a cozy, and the quirky artwork works well as an attention grabber. As you've probably guessed, the Cozy theme is "Knitting". What I didn't expect about a "cute cozy" was that the poor Llamas would be put through so much abuse! There's one scene where someone with a paintball gun shoots the group, injuring several by almost taking out the eye of one, gives a concussion and induces seizures in a second victim, and breaks the ribs of another. If that's not bad enough, a few chapters later one Llama is actually stabbed and bleeds to death in the arms of its owner. While I want to learn crocheting (I'm the slowest person ever), knitting holds little interest for me. The main way it influences this fifth book of the series is because they all are part of a club that knits together. One of the members owns a Llama farm for their wool as a new business venture. After the Llamas are brutalized, the neighbor who makes threats has been murdered. The husband is the main suspect, so the knitters circle must rush to clear his name and find the actual culprit. There's some sideways tension such as not liking the lead detective, and the point of view shifts conservatively amongst 3-4 women. There are enough suspicious red herrings to keep it interesting and the reader unsure on the actual culprit. While I didn't warm up to this right away, it's one of those books that keeps getting better the further you read. The dialogue isn't wholly convincing and suffers from the unrealistic name dropping and unneeded conversations about mundane, everyday things we care nothing about. There's also too much tell instead of show in the writing style. BUT the story gets better the longer it goes on, and some of the dialogue becomes downright charming and sometimes genuinely funny.